Whether you wish for a stroll along squeaky clean white sand, TO DIP YOUR TOES OR BOARD into crystal clear blue waters or WATCH A dazzling Indian ocean sunset, Perth has got it all! List of Beautiful Beaches Perth! There is an 80km stretch of coastline with beautiful beaches to be enjoyed in Perth, each offering its own unique surroundings, breathtaking views and all the right ingredients for a fun day out. List of Beautiful Beaches Perth City! ( Claytons Beach) : Located at the south of the Mindarie Keys marina, this quaint little un-patrolled beach spans for 300m at the end of which it meets a small bluff separating it from Burns Beach. It generally has good conditions for surfing and body boarding although can tend to be quite reefy so care should be taken when swimming. The beach may be accessed through the several surrounding bush walks or the southern Mindarie Keys car park. This is a favourite amongst locals due to its close proximity to the City of Joondalup. This 200m sandy beach is particularly popular amongst hang gliders. There is a café and restaurant with outdoor seating for those wishing to catch a sunset and the stunning coastal views. This is one of the most popular patrolled beaches in the Joondalup area. The northern part of this long stretch of coastline is where surfers head to catch the higher waves. The waves tend to be moderate toward the south end making it the best area for swimming. The beach is home to the Mullaloo Surf Live Saving Club which is located within the natural foreshore reserve in the central-northern section of the beach. Mullaloo also boasts one of the most beautiful parklands in the area suitable for family gatherings such as picnics or barbecues. Visit Sorrento Beach for a fun-filled day out This 600m patrolled a stretch of squeaky-clean white sand and crystal clear waters have conditions which favour both swimming and surfing making it a regular go-to spot for both families and surfers alike. Situated on the North Western corner of the beach is Hillary’s Boat Harbour renowned for its array of entertainment options for both the day adventurers and night crawlers, including, but not limited to, the Aquarium of Western Australia (AQWA), The Great Escape water park and the Sorrento Quay Boardwalk. The harbour boasts its own bustling retail strip for keen shoppers, not to mention some of the most beautiful surrounding parkland making it an attraction for almost anyone. There is also the opportunity to leave for an adventure to Rottnest Island as well as a helicopter tour, whale watching or diving. This quaint 150m beach lies just off the West Coast Drive. The absence of reefs and presence of smaller waves makes it appealing for those looking to swim. The northern section has a section fenced off, behind which lies a fishing platform for any avid fishermen. If you’re looking for a relaxing stroll, a surf, a swim, a view or a bit more of an adventure, this part of the coastline has literally got it all. Trigg beach is very popular amongst surfers and body boarders alike, especially by the rocky point known as Trigg Island. However, the northern section is home to a natural pool known as Mettams Pool. This little section of the beach is reef protected allowing for calmer waters, making it attractive for both young swimmers and the elderly. This is also an ideal place to catch sight of some of Western Australia’s marine life either by snorkelling or simply attempting a reef walk when the tide is low enough. After a day of spent by the sea you can venture towards Clarko beachside reserve or one of the nearby cafes to take in the day’s encounters before heading home. One of the most Beautiful Beaches Perth: Scarborough Beach: Are you looking for a white sandy beach with clear blue waters and a social feel to it? Scarborough is the beach for you! 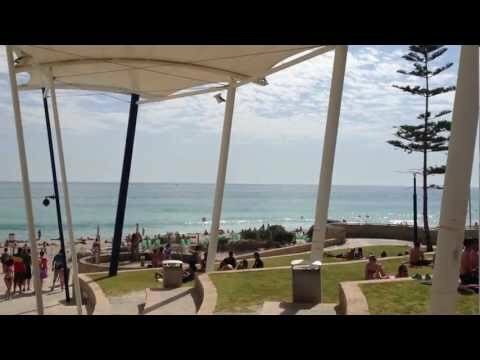 This is amongst one of the most popular spots for beach-goers in Perth and as soon as the summer months hit, it is swarmed with people on a daily basis and for good reason. It’s pristine white sand and turquoise waters will tempt any passerby, especially in the earlier hours of the morning when the waves are at their calmest. As the wind and waves gain momentum later on in the day, the beach sees the water sports enthusiasts hit its shores as the kite and windsurfers set out to hit those waves creating a beautiful display of colour for onlookers. For those looking for more quiet surroundings, the beach’s long stretch of white sand offers plenty of options for more peaceful spots. The extensive grassed area above the beach is largely shaded by the majestic native Norfolk Pines as well as a number of scattered little wooden shelters. It provides the perfect space for a good old barbeque or any type of social gathering. The children’s playground is an added bonus as it gives parents a little break from entertaining. Besides having all the amenities required for a good day out, across the road from the beach are a variety of bars, nightclubs, cafes and restaurants. The area is also popular amongst tourists and offers backpacker accommodation as well as more upmarket accommodation in close proximity to the beach. Located just off the West Coast Highway, this beach is the quieter alternative to the popular City Beach, both located in the township of Cambridge. It offers the right conditions for swimming, surfing, and kite surfing. It is also popular amongst fishermen who make their way to the sea at dawn and dusk to try their luck at a good catch! The beach café is a popular spot for lunching or sitting back and watching the beautiful sunsets. Floreat is also home to its own surf lifesaving club and has all the necessary amenities for a comfortable day at the beach. Accessible via Mounts Bay Rd, this beach is located between Cottesloe and City Beach and is one of the quieter spots in the area. Having said that, it is home to the Naked Fig, one of Perth’s most popular cafes, which, although not necessarily intentional, seems to neatly tie in with the nudist theme of this beach seeing as the Northern section has a marked strip which is officially clothing optional! So for anyone wishing to get rid of their tan lines, this is the place to be! For those looking for a good ole swim, the waters here are clear and calm, especially in the early hours of the morning. The sea gets a little choppier in the afternoon making it ideal for body boarding. This beach is patrolled and has its own surf club and ample parking space. Perth’s most popular and well-known beach! You know you’re heading in the right direction when you catch sight of the grand art deco Indiana teahouse which is perched on top of a flight of stairs leading all the way down to the beautiful Cottesloe beach. The beach’s squeaky clean white sands stretch for 1.5km, extending from Mudrup Rocks to Swanbourne beach. It is definitely one of the most popular beaches in Perth, having both the calmer waters and the more energetic parts catering for keen body boarders and swimmers alike. What makes this place especially unique are the grassed terraces which back a large portion of the beach and provide a good space to bask in the sun. It is the perfect spot for socialising amongst family and friends. There is a walking path up top for the strollers or those out for a run, not to mention the outdoor gym equipment for exercise enthusiasts. Apart from the teahouse, which also houses the surf life savers on the ground floor, the road across from the beach has ample cafes and restaurants should hunger strike! The beach itself is just off the Marine Parade for those arriving by car and just a short walk from Cottesloe station down Forrest Street for those travelling on foot. During the summer months, the Cottesloe Council also runs a free shuttle bus every 15 minutes between the station, the main beach and North Cottesloe. This 1.5km beach is a favourite amongst people living south of the river. It has a quaint port feel to it with views of the sky high cranes to the south, and container ships patiently waiting to enter the harbour on the horizon. It is perfect whether you are looking to kite or windsurf, swim or just enjoy a nice long stroll along the white sand. The main swimming spot is by the surf club, however, the northern section also known as Mosman beach, is popular for snorkelling. The beach has all basic amenities including changing rooms. It is easily accessible by train, with just a short walking distance from North Fremantle Station to the south side or Victoria Street Station to the northern part. Port Beach: This is a very family friendly stretch of coastline, characterised by its very gentle waves, turquoise water and white sand. It is another popular beach amongst locals, especially the elderly and families with small children as the waves are not confronting, making it perfect for those still getting acquainted with swimming. Apart from all the basic amenities, the beach café has a little playground perfect to keep the children entertained while the adults snack and chat. The beach does not have its own surf lifesaving club, however, it is patrolled during the busier months of the year. It’s probably easiest to get here by car however the North Fremantle station is an option with a 1.5km walk to the beach. This beach showcases the diverse nature of Fremantle and has a beautiful community feel to it. Its 200m southern section is the most popular and is perfect for a swim or just to sit for a moment and take in the breathtaking views of Rottnest, Carnac and Garden Islands. (Ferry)The grassed area backing the beach sees many social gatherings, be it a picnic, a simple catch up or even maybe some slack line practice – if you’re lucky you’ll even witness someone showcasing some acrobatic talent! The many scattered trees provide a good escape from the sun’s rays on a blistering summer’s day. There’s also a pirate themed playground for any pirate enthusiasts. This beach hosts the Saturday Sunset food market from 6-8pm during the summer months, which brings yet even more people to the beach to share food, listen to live music and be merry. This is definitely a place were tourists and locals alike meet and share in the beautiful space and good vibes. The beach café is another perfect spot for a coffee or a meal. Getting to South Beach with public transport is simple. You can catch a train to Fremantle Station and then catch the CAT free bus service right outside the station, straight to South Beach. There is also ample parking space if arriving by car. This 3.7km stretch of coastline is perfect for swimming, surfing and fishing or just a relaxed coffee at one of the nearby cafes. It is one of the most reliable escapes for children marked by its transparent turquoise calm waters. The beach is watched over by the Coogee Surf Life Saving Club which is located in between the two jetties. The jetty at the southern end is backed by a big grassed area with lots of shelters and perfect for a BBQ. There is also a camping area for those wishing to stay overnight. This is one of Perth’s money making hubs, home to its southern prime industrial zone. However, hidden behind this concrete jungle lies a little shangri-la, a suburban town, which boasts the beautiful Wells Park, as well as a picturesque 1.3km white beach suitable for both swimming and fishing. This offers a little escape from the busier side of town whether it be for a swim, a BBQ, or just some relaxation time under of the shaded areas whilst the kids play on the swings. Ample parking space is provided as well as public toilets and a jetty. As its name suggests, this idyllic sheltered beach is renowned for its shallow waters. Even though it is unpatrolled, the waters are relatively calm due to the protection from its surrounding islands. The cross shore breezes make this also a prime site for kite boarding sessions. The beach forms part of the larger Shoalwater Bay Marine Park offering a good opportunity to explore its natural wonders and who knows, possibly some encounters with sea lions, penguins and dolphins. This is the perfect place for some diving or snorkelling or if you prefer to stay above water, you can try your hand at kayaking or canoeing. It really is a prime location for a fun filled day out! Stretching from Becher Point to Golden Bay beach, this 5.7km long beach offers space for both swimmers and surfers alike. However, conditions vary and rips are unpredictable, therefore care should be taken when choosing where to swim. The southern section takes patrol precedence as it offers an 80m wide surf zone, however, this varies based on the number of people and activities happening on the beach. Several parking bays may be found along the developed area. Neatly tucked away behind tall sand dunes in the outer southern suburb of Golden Bay, Rockingham is one of Perth’s little secrets. This 2.5km stretch of white sand definitely takes a backseat when compared to the likes of Cottesloe and Scarborough. However, this is what makes it so special, as apart from the regulars in the area, it is hardly frequented. To top it off, it boasts a well-maintained park, as well as BBQ facilities, a shower block, toilets and ample parking space. So, for those lone wolves or anyone wanting to get away from the congregation of the masses, this beach offers equal beauty to the more popular beaches as well as peace and tranquillity – It is definitely worth the visit! This 2km stretch of pristine shoreline is located on the fringe of the northernmost suburb of Mandura. The aura of peacefulness that permeates the air when enjoying a day by the sea is a reflection of the laid-back lifestyle of the Madora Bay community. They take great pride in this natural area and space it offers for walking, surfing, fishing, boating and of course, swimming. The Madora foreshore reserve which lies parallel to the beach is also an opportunity for a brisk walk or relaxation on the lush turf. Carparks are located in the south end and centre of the reserve. This 1.6km stretch of white sand and turquoise waters are part of the Mandurah coastline and can be accessed via various walk paths along Ormsby Terrace. It’s a peaceful, family-friendly beach, perfect for swimming or just picnicking. There are plenty of parking bays on the southern end as well as various amenities such as BBQs, public toilets, showers, and a playground to keep the kids entertained. Beautiful Beaches Perth Always Beautiful! Hey There. I came across your website using msn. This is a very well written article. because if like to read it. other folks consider concerns they just don’t recognize about. First of all I would want to say awesome blog! I had a quick question which I’d love to ask in the event you don’t mind. yourself and clear the mind just before writing. I’ve had a difficult time clearing my thoughts in getting my ideas on the market. the very first ten to fifteen minutes are generally wasted just trying to figure out how to begin. Any recommendations or tips? Hi, after reading this remarkable piece of writing i am as well cheerful to share my knowledge here with friends.